Over the past decade, cities in the U.S. and around the world have responded to people's call for political action on climate change. San Francisco is a leader among them. Mayor Mark Farrell committed San Francisco to net-zero greenhouse gas emissions by 2050, a move that will eliminate the City’s carbon footprint. San Francisco joins 25 other cities from around the globe that have made the commitment to accelerate emission reduction plans. The pledge aligns with the Paris Climate Accord and builds on San Francisco’s track record of successfully reducing emissions while simultaneously growing its economy. 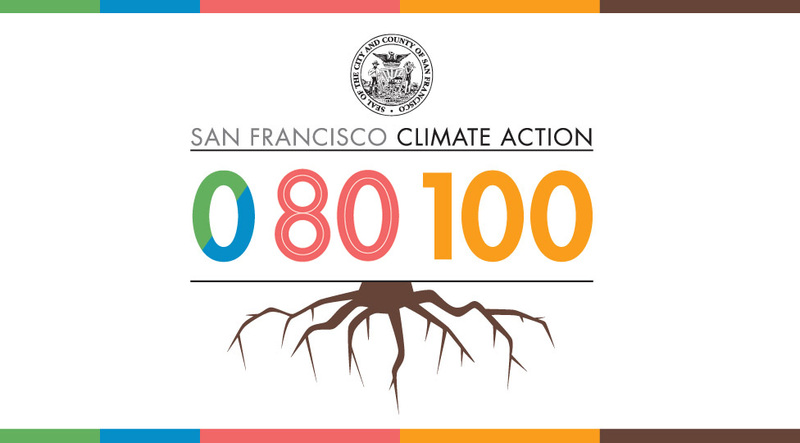 80 stands for 80% Sustainable Trips in 0-80-100-Roots (changed from: 0-50-100-Roots), the San Francisco’s climate action framework that will help us meet the challenge of climate change through innovative policies, programs, and partnerships. Mayor Mark Farrell announced that Bay Area ferries will make historic transition to renewable diesel, becoming the first region in the nation to adopt the environmentally-responsible fuel standard. Renewable diesel made from nonpetroleum renewable resources like natural fats, vegetable oils, and greases, works just like regular diesel and can reduce greenhouse gas emissions by 60 percent or more. San Francisco Commission on the Environment passes a resolution adopting citywide biodiversity goals and articulating the role of the Department of the Environment in protecting San Francisco's natural heritage. The vision is to enable all San Franciscans to connect to nature daily and inspire to participate in some form of ecological stewardship of the City’s natural heritage. The EV Readiness ordinance requires all new buildings in San Francisco to install electric vehicle charging capacity. It will make plug-in electric vehicle charging more widely available in new building stock, while helping to reduce citywide greenhouse gas emissions and air pollution. Mayor Lee, the San Francisco Public Utilities Commission, and the San Francisco Department of the Environment’s announced the City’s goal of 50 percent renewable electricity supply by 2020. Offering CleanPowerSF to every eligible SF resident and business is the single most crucial factor driving greenhouse gas emission reductions from San Francisco’s energy sector. San Francisco became the first city in the US to ban the sale of upholstered furniture and juvenile products made with or containing an added flame retardant chemical, which have been known to or strongly suspected of adversely impacting human health or development. Effective January 1st, 2017, San Francisco became the first U.S. city to mandate solar and living roofs on most new construction. With the passage of this legislation, between 15% and 30% of roof space on most new construction projects will incorporate solar, living roofs, or a combination of both. Starting January 1, 2017, San Francisco prohibits the sale of food service ware and packing materials made from polystyrene foam, making it one of the strictest bans on polystyrene foam products in the country. CleanPowerSF is San Francisco’s Community Choice Aggregation program and gives residents and businesses the option to choose electricity generated from 100% renewable resources (solar and wind) in California. The 2016 Geographic Greenhouse Gas Emissions Inventory provides a summary for San Francisco’s GHG emissions. In 2016, San Francisco successfully reduced emissions 29% below 1990 levels from 6.2 million to 4.4 million mtCO2e. Declines occurred across all five tracked sectors. Emission reductions were achieved even though San Francisco’s population increased by 20% and GDP increased by 111%. Mayor Lee announced San Francisco’s 0-50-100-ROOTS climate action strategy: send zero waste to landfill, make 50% of trips by sustainable modes, source 100% renewable energy, and sequester carbon through urban forestry and compost application (roots). Following Alameda County’s landmark legislation, the San Francisco Board of Supervisors passed the Safe Drug Disposal Stewardship Ordinance requiring medicine manufacturers who sell their products in San Francisco to provide all San Francisco residents with a safe and convenient way to dispose of their unwanted home-generated medicine. Mayor Ed Lee and Board President London Breed announce that San Francisco’s greenhouse gas emissions in 2012 were 23 percent below 1990 levels and the City is on track to reduce its greenhouse gas emissions 25 percent and 40 percent below 1990 levels by the year 2017 and 2025, respectively. After visiting the Vatican, Mayor Lee announces San Francisco will phase out the use of petroleum diesel in its municipal fleet, including Muni buses and fire trucks, and replace it with renewable diesel. Can you imagine a San Francisco without trees? The Urban Forest Plan provides a long-term vision and strategy to improve the health and sustainability of the San Francisco’s urban forest. The Board of Supervisors approved legislation restricting the sale or distribution of plastic water bottles on City property and increasing the availability of drinking water in public areas. The San Francisco Department of Environment completes the San Francisco Climate Action Strategy Update, under Mayor Edwin Lee. The US Court of Appeals upholds the finding by the US Environmental Protection Agency (EPA) that GHG emissions endanger public health and contribute to global warming. This same year, the San Francisco Department of the Environment partners with the US EPA, Region 9, to conduct an evaluation of the health benefits associated with local climate policy. The study concludes that the Climate Action Plan’s reduction measures will result in significant economic benefits (approximately $114 million) from improved health outcomes. San Francisco extends its plastic bag ban, reducing unnecessary waste and litter, and protecting marine life. Potrero Power Plant closes in January following the completion of the Trans Bay Cable project, which allows power generated across the Bay to be transferred to San Francisco. The closure of this dirty power plant helps to greatly reduce San Francisco’s carbon footprint and also decreases the carbon instensity of the overall statewide electricity grid. San Francisco, with Green Cities California, publishes one of the first consumption-based greenhouse gas inventories in the nation. Unlike the traditional GHG emissions inventory which only accounts for carbon emissions associated with energy use in buildings and fuel burned in local vehicles, the consumption-based inventory looks at carbon impacts of the full lifecycle of goods and services. The Existing Commercial Buildings Energy Performance Ordinance was passed to help the local market maximize energy efficiency in San Francisco commercial buildings. The ordinance aims to empower owners, managers, operators, and occupants with key information to control utility costs and reduce greenhouse gas emissions by improving energy efficiency. After thorough study of the scientific evidence, the U.S. Environmental Protection Agency declares that greenhouse gas emissions are a public health threat. The finding allows the agency to finalize GHG emission standards for light-duty vehicles and to regulate coal-fired (polluting) power plants. At the commemoration of the Sunset Reservoir Solar Project, comprised of 24,000 solar panels, San Francisco Mayor Newsom announces the goal of 100% renewable electricity by 2020. Assembly Bill 1493 (Pavley) is the first law in the nation to address greenhouse gas emissions from passenger vehicles. California’s Clean Car Standards requires increased gas mileage. Passed by the Board of Supervisors, the Mandatory Composting and Recycling Ordinance requires all San Franciscans, residents and businesses to separate recyclables and compostables from landfill trash. Simultaneously, San Francisco reaches its 75% waste diversion goal a year early. Governor Arnold Schwarzenegger signs Executive Order S-14-08 to expand California’s Renewable Portfolio Standard to require all retail sellers of electricity serve 33% of their load with renewable energy by 2020. Mainly because of the closure of the Hunters Point Power Plant and an increase in renewable energy use, San Francisco’s community-wide greenhouse gas emissions decrease by 7%, slightly besting Kyoto targets. The Green Building Ordinance is phased in over 5 years, starting by requiring new large commercial and high-rise residential buildings to meet a LEED standard. By 2012, LEED Gold is required for new large commercial buildings and major renovations, Today, all new construction and renovations must be built green. The San Francisco Board of Supervisors adopts Ordinance No. 81-08, the Climate Change Goals and Action Plan (PDF), mandating the annual reporting of GHG emissions and reduction plans by City department. In 2008, all City and County of San Francisco departments began annual reporting on their carbon footprints with the Departmental Climate Action Plans. San Francisco achieves a major environmental justice victory by closing the polluting Hunters Point Power Plant and meeting a central goal of the San Francisco Electricity Resource Plan. Governor Arnold Schwarzenegger signs AB 32, the Global Warming Solutions Act of 2006, establishing a goal to reduce statewide greenhouse gas emissions to 1990 levels by 2020. San Francisco bans plastic bags at large grocery stores and retailers, and bans Styrofoam containers in restaurants and hotels in the nation’s most extensive bag ban to date. The City requires all municipal construction building projects to attain LEED Silver and green building certification. LEED certification (Leadership in Energy and Environmental Design) is a rating system for green solutions to a building’s design, construction, operations, and maintenance. In 2012, requirements for municipal buildings were raised to LEED Gold certification. In response to a commitment made by the private and public sector at the U.N.’s World Environment Day and under the U.N. Global Compact, a consortium of Bay Area business leaders establish the Business Council on Climate Change (BC3), a unique public-private partnership committed to reducing greenhouse gas emissions. BC3 endorses the Principles on Climate Leadership, a strategic framework to address climate change, and provides a forum for sharing best practices. The U.S. Conference of Mayors formally endorses the Mayors Climate Protection Agreement. Mayor Newsom signs the agreement, committing San Francisco to fight climate change and support the Kyoto Protocol emissions reduction targets. The San Francisco Department of Environment, under Mayor Gavin Newsom, publishes one of the first community climate action plans in the country as part of its commitment to the U.S Conference of Mayors Climate Protection Agreement. The aggressive goals and detailed actions directed by the Climate Action Plan for San Francisco breaks ground in the American climate policy movement, establishing San Francisco as a national leader in city-driven climate action. The San Francisco Department of Environment establishes the San Francisco Municipal Environmental Code. The Environment Code consolidates the City’s existing ordinances governing protection of the environment, natural resources, and sustainability. California passes the Renewable Energy Portfolio Standard requiring that 20% of all power delivered by PG&E, the City’s primary power provider, come from eligible renewable resources. In 2008, this percentage was raised to 30%, with an increase to 33% by 2020. The San Francisco Board of Supervisors adopts a Zero Waste goal for 2020, with a 2010 goal of 75% diversion from landfill. The “fantastic three” blue, green, and black bins are rolled out, along with citizen education and outreach. US leads negotiations on the Kyoto Protocol, then does not sign the agreement. The Kyoto Protocol is an international agreement, linked to the United Nations Framework Convention on Climate Change. It sets binding targets for 37 industrialized countries and the European community for reducing greenhouse gas emissions. The San Francisco Board of Supervisors passes Resolution 158-02 which calls for the City to develop a plan to reduce greenhouse gas emissions. A citywide effort involving hundreds of San Franciscans culminates in the 1996 publication of San Francisco's Sustainability Plan, and its adoption by the Board of Supervisors the following year. For a list of additional milestones from 1996-2013, download the Climate Action Strategy Update 2013.